Drapers restaurant is named after Dorothy Draper, the woman who decorated the Greenbrier as it currently looks. She must have been a fun loving person as much as she loved color! Speaking of color, these lovely ladies were waiting to be seated at Drapers and I couldn’t resist getting a group shot. They were happy to oblige. They ended up sitting next to us and I enjoyed watching them all order ice cream! Some notes about the decor: You can see into the casino from Drapers (on the left); That is a picture of Dorothy Draper on the back wall; And, once again, the lighting is fantastic! Surprisingly, I skipped the cocktails and ordered iced tea. It seemed the proper southern lady thing to do. 🙂 We also skipped appetizers, since we were going to be eating a big dinner…but you’ll later see that didn’t stop us from ordering dessert! My daughter ordered the shaved ham and swiss sandwich. It was served on a homemade pretzel roll with honey mustard aioli. She loved it! I tasted it as well and thought it was really good. Lots of meat, which I enjoy in a sandwich and the sauce was yum as well. My son got the chicken and waffles. That chicken was delicious! Super crunchy! I didn’t taste the waffles, but he ate every last bite, so they must have been pretty tasty. Next up, my husband got Dorothy’s chicken salad. This is one of Dorothy Draper’s recipes that they have been serving since 1945. Those are candied almonds on top with fruit and popovers on the side. Once again, it was great. Although he didn’t really like the popovers…he said there wasn’t much to them, that they were like air. 🙂 He is more of dense bread kind of guy. My turn! I got the fried green tomato sandwich with sweet potato fries on the side. YUM! I just love how southern this sounds. I miss the south, including the tastes of the south. So I just had to get this. It had chevre cheese, spinach, smoked bacon, onion and black pepper mayo on it. We all loved our entrees and will definitely eat here again when we come back. Now on to dessert! How could you not get dessert when there is an in house ice cream parlor that looks like this? These nice men were walking out when I was about to snap my pic and they offered to pose for me. How cute is that? People are so friendly at the Greenbrier. 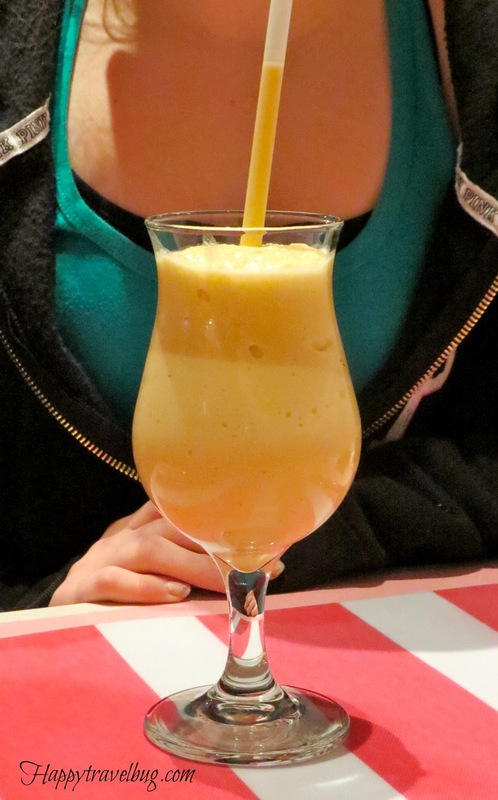 My daughter got the Greenbrier peach milkshake. They are known for their peaches apparently. It was good, but I am more of a chocolate/peanut butter milkshake kind of girl. Yes, this was as good as it looks! My son and I actually split this banana split. We customized it to our liking, making it the best banana split ever! It included: vanilla ice cream with hot fudge (all for my son), chocolate ice cream with strawberry sauce (we shared), and peanut butter ice cream with marshmallow sauce (all for me). DE-LISH-US! As you can see, we liked it! 😉 And my husband didn’t even have to help clean the plate! So I’m wondering…do you have a plate cleaner in your family? That place looks like so much fun! I love the pic of the hat-wearing ladies. 🙂 Everyone's food sounds just amazing, but I think I'd have been partial to the ham and cheese sandwich, especially as it was on a pretzel bun! It is hard to not love anything on a pretzel bun! Oh man, what amazing looking eats! 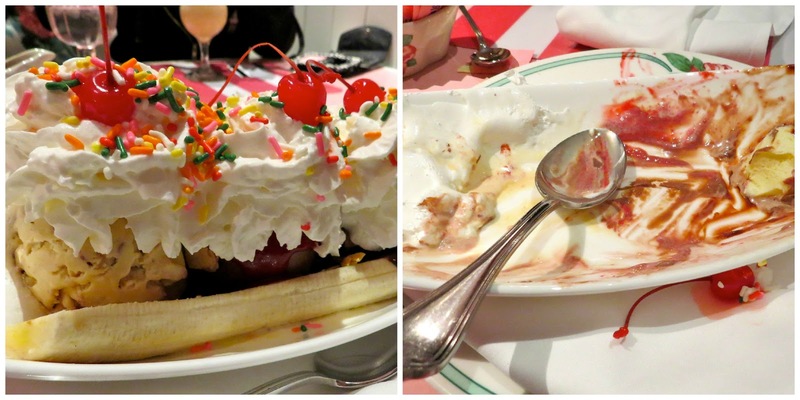 Especially that banana split! Haven't had one of those in forever. That place looks so fun and magical! After all your Greenbrier posts, I so want to visit now. Love all the food here and salivating once again especially the chicken and waffles and that banana split. Again, I shouldn't read your food posts before bedtime. Your family knows how to eat. Just been catching up on your posts. Loving the decor here,the colourful guests and, oh my goodness, the food! All looks so good, Know what you mean, Chocolate & Peanut Butter shake, Add some Banana, And you've got yourself a shake.